My Foods section collects all the foods you have logged before. 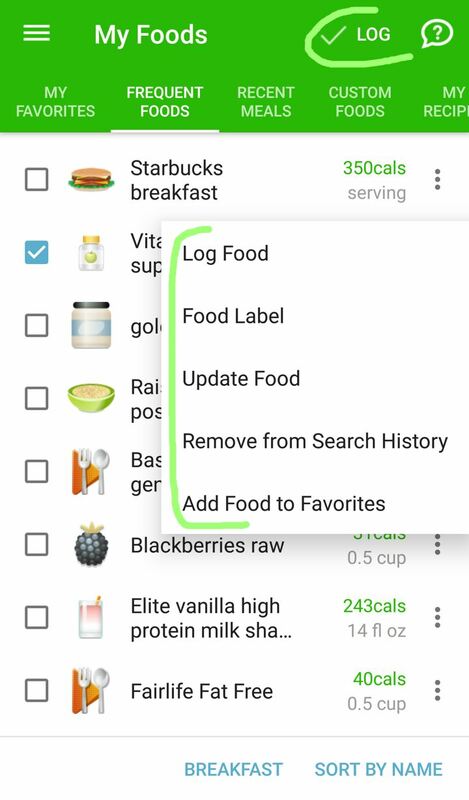 Multiple food lists let you select and log foods quickly instead of searching for them. You can also manage individual foods. Tap three dots &vellip; button located next to any listed food to see what you can do with it. This list contains foods you marked as favorites for faster logging. Tap ADD FOOD TO FAVORITES to find the food and add it to the list. You can also add the food to this list by marking it as Favorite while logging the food. In order to remove the food from this list, tap three dots &vellip; button and select Remove from Favorites command from the menu. Tap meal name at the bottom to display foods logged in a selected meal type or in all meal types. Sort the list by name or by recency. This list contains the meals with foods you have logged recently. It grows automatically as you keep logging. Tap the meal to see individual foods. Tap three dots &vellip; button to manage your custom food. Tap three dots &vellip; button to manage your recipe. Use PhotoFoods segment to submit and review PhotoFood service orders. Tap three dots &vellip; button to manage your PhotoFood. Tap three dots &vellip; button located next to any listed food to see what you can do with it. The menu will contain actions like Log Food, Food Label etc. See also action descriptions below. You can retire Custom Food or Recipe you have created below. After retirement the food and its logged entries are not lost: the food is simply marked as retired and you stop finding it. Remove from Search History action allows you to clear search history. This action is especially useful when you mistype food name, MyNetDiary remembers it and keeps showing it in search results.